PULLED OUT OF RETIREMENT, AGAIN! PLEASE GIVE A WARM WELCOME TO MAGIC! I don’t know about this…I have been called out of retirement to work with a youngster, turn him into a Therapy Dog. Mmmm…think I can score some extra BusyBones for sharing my expertise, my years of experience? What? Yes? OK? OK, My Dad says he will provide one extra BusyBone a week, but that is all…just one. Seems my new young charge is also a Border collie and that transferring my skills to him shouldn’t present any major difficulties. But all rescue dogs have a story…can you give me a briefing? My Dad is in a very good mood. We just returned from a long car ride. In spite of the snow and wind, My Dad kept the left rear window open ALL the time so I was given the opportunity for plenty of barking at all despised delivery trucks. Hello. Anyone home? Earth to Dad. Yes, a briefing on the new Border collie. Blah, blah, blah…that’s it? That’s his story? Let’s see if I got all that. 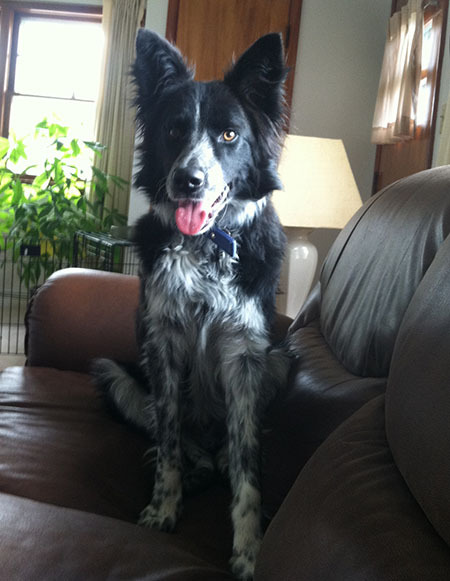 This young male Border collie was found as a stray somewhere down in southern Illinois, near Quincy. That is Adams County, where My Dad and I worked that Arson-Methamphetamine case. If you don’t remember that very interesting story that also mentioned McDonald’s hamburgers, go back in my archives and take a look at it. Seems when the Adams County Humane Society has a Border collie brought in, a quick phone call goes out to Great Lakes Border Collie Rescue (GLBCR). 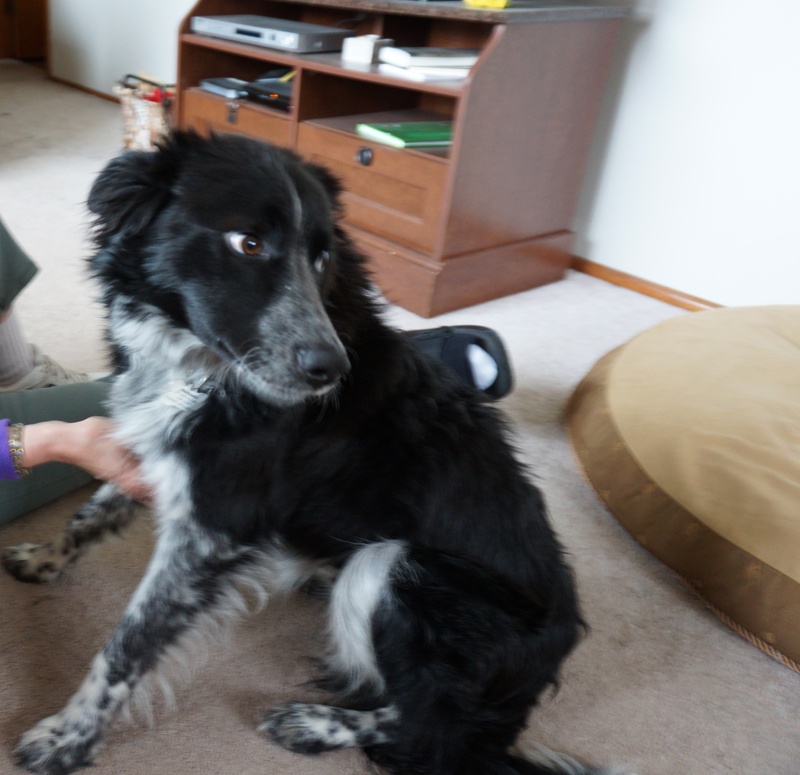 A GLBCR volunteer rescued this young male (un-neutered…”dude you won’t stay un-neutered for long, sorry”) Border collie and drove him to Crown Point, Indiana to be fostered by Kathy. Kathy named him Reade. Recognizing Reade’s looks and personality as a potential Therapy dog, Kathy contacted My Dad who had been looking for another Border collie for Therapy dog work. As you will recall, I am in semi-retirement. This past Saturday, My Dad, Chris, and Kim, traveled down to Crown Point to meet this “diamond in the ruff” (Thanks, Kathy). My Dad was very taken with the sweet nature and extremely good looks of Reade, so after my approval (I get along with everyone) which will take place on December 6th, Reade will take on a new identity…his new name will be MAGIC! Pretty cool, right. A magical Border collie, rescued from Adams County, Illinois who will soon be a working Border collie, a Certified Therapy dog. This young Border collie’s new name will be MAGIC! This entry was tagged border collie rescue, border collies, dog rescue, dogs and people, life with dogs. Bookmark the permalink. You’ve had a good teacher and lots of good experiences. I’m sure you will be a fine example to “Magic”. and his friend as well. I hope you enjoy your work and do as good a job as your Dad did with you. Hi thanks for visiting and liking my blog – it looks like we may have more in common than Border Collies (though that’s a good start point!) – I’m also a Veteran (Royal Marine Commandos) and after that I was a police officer in the UK. Now I’m just having a good time in the hills and mountains, with my Border Collie ‘Mist’. Looking forward to reading more about your wonderful dogs. Cody is my 13 year old BC, and the new guy is MAGIC who was adopted on Saturday. Magic’s age is unknown as he was a stray from southern Illinois…latest estimate is two-ish…his teeth and gums are in gorgeous condition, a very athletic 34 pounder. I am very jealous of your hiking stories, sounds great to have long hikes with your dog. I’ve been a soccer (football) referee for 28 years. DO you follow the Premier League? Mist is just coming up seven years and weighs in at 19 kilos (about 42 pounds) and not a scrap of fat! She’s a strong, tireless hill dog in her prime, and my best buddy in the mountains. In my mid teens I discovered the great outdoors, and traditional sports went out of the window – it’s one of the reasons I joined our Marine Corps. I specialised in Mountain and Arctic Warfare and spent three winters in Arctic Norway, training to make life difficult for the Soviets had they ever tried to make a move on the ice-free ports on the Norwegian coast. I guess your service was a bit warmer, in all sorts of ways. Respect to you! And, respect to you, sir!